I am an ardent believer of backups. My desktop computer is backed up nightly to an external usb drive using a program called Back In Time. It uses the famous rsync program to do the backups. The neat thing about rsync, is that it uses hard links to link to previously backedup files that have not changed. What this means, is that if a file does not change, it is not copied multiple times to the hard drive, but just once. This saves a very large amount of disk space, while preserving the original directory structure. Back In Time is started though a cron job, and as long as the desktop computer is on, it will be backed up. By the way, my computers run with the UBUNTU Linux operating system. These instructions are for Linux and will not work on Windows systems. My laptop us running Ubuntu 11.10, and my server is running Ubuntu 10.04.3 LTS. Check out Ubuntu Linux at ubuntu.com. The setup for my desktop will not work for my laptop. My laptop is not always on, and is not always available around the home network to be backed up. I needed a system that would automatically backup my laptop whenever it is on, but only once a day. I have been doing manual backups, but that is a hassle. I may eventually employ this backup method to my desktop so I don’t have to keep it on all the time either. Here are a couple of problems I needed to overcome. If I mounted a server drive from my laptop, and backup remotely to the server, rsync would not preserver the hard links. This not only takes up a lot of disk space, but every file would need to be sent over to the server during every backup. Over wifi, a typical backup would take longer than a day. Not ideal for a daily backup. I therefore, had to initiate the backup from the server. This meant, sshing into the server, mounting the laptop as a drive in the server, and starting the backup from the server end. I searched for solutions to these problems, and came up with a multitude of answers that were not particularly ideal for me to impliment. One solution was to use NFS to mount the drives in fstab. I did not want to put it in fstab because, I did not want it to mount automatically when the server booted (or the laptop for that matter). Another solution was to continuously poll for the existance of the laptop, from the server, and when it ‘appeared on the network’, start a backup. I then would have to keep track of it to make sure it was only backed up once a day. None of these solutions suited me well. Through a bit of more studying and searching, I discovered that a remote script can be run by ssh. I use ssh all the time to connect to my server, and finding that I was able to start a script on the server just by initiating an ssh session was a revelation to me. Another tool that I found was “anacron“. Anacron is kind of like cron, but enables you to run something x number of days, weeks or months. And, if the computer is not running at midnight, anacron will make sure the program will run sometime during that day as long as the computer is on sometime in that day. Unlike cron, anacron does not enable you to run a program multiple times a day, or at exact times. This is exactly what I was looking for and anacron was already installed on my laptop, and was already set up to run upon boot. This is not exactly a step by step tutorial, as you need to know how to get around your system, and run things as root. This is the command to generate the keys. I wanted unattended backups, so I did not enter a passphrase. I also had to copy the keys from the .ssh directory in my home directory to the .ssh diretory in the /root directory. *** EDIT 11/3/2012 *** I updated my operating system, and neglected the above step. The backups failed, and I really scratched my head wondering why. Anacron (see below) is run as root, so it is imperative that the ssh keys be placed in the /root/.ssh/ folder. I like sshfs to mount my remote directories. or find it in the Ubuntu Software Center. You will also need a recent version of Back In Time. I have v1.0.8 installed. The difference between the newest version and older ones, is that the newer version can have multiple profiles. That is, you can have a different profile for each computer you want to back up from your common point (server). Some explaination is needed here that probably should have been mentioned sooner. 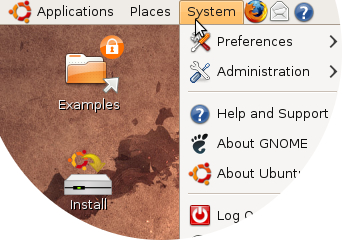 My server has ubuntu-desktop installed on it (that is, a full gui interface). The Back In Time profile configuration is easily done with the gui. Then the actual backups can be done with the command line. This also means that if you don’t have a server, your desktop computer should work just fine to backup your laptop with these instructions. There is nothing really “servery” about the process. You need to make a mount point on your server where you want to mount your laptop drive. Create a blank directory where you want it mounted. I chose “/home/ubuntu-laptop” as my mount point. Create directories on your laptop and on the server where you want the script files to go. On my laptop, I put my backup script in “/home/myhome/Scripts_and_Programs/server_backup”. You can put yours where ever you want. On my server I put the script in “/home/myhome/Scripts”. I use static ip addresses for my home network devices. You can set up a static ip for your laptop and server in the network manager, but I chose to let the rounter do it. My router lets me pick a certain ip to be assigned by its DHCP. It is based off the mac address of my laptop wifi connection and my server eithernet card. My laptop is assigned 192.168.1.5 and my server is 192.168.1.11. By letting the rounter assign the addresses, I am free to take my laptop somewhere else, and some other wifi rounter will be free to assign my laptop any address it needs to. should work, and no password is necessary. On your first connection, you may be asked to accept the key. Answer “yes” and proceede. 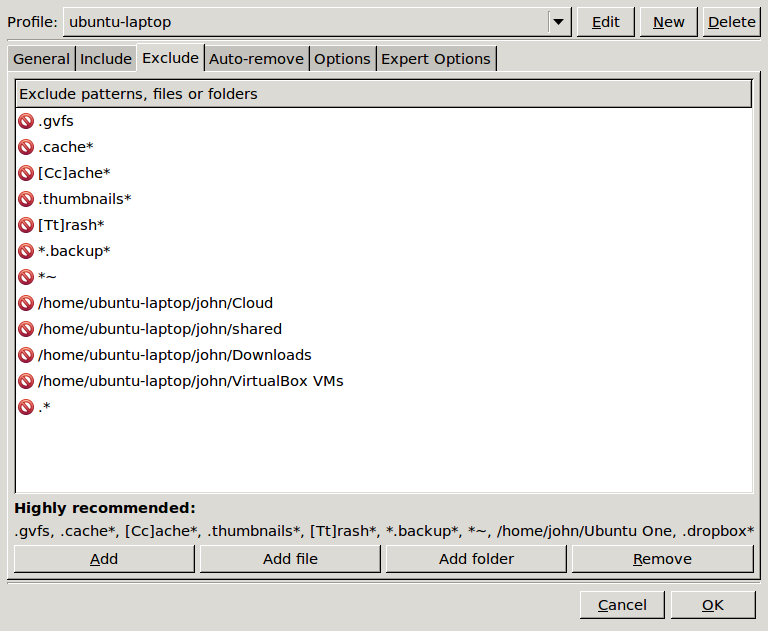 If you go to “/home/ubuntu-laptop”, on your sever, you should now see your laptop files. Again, the first time you do this, you may be asked to accept the ssh keys. You will also be asked for your laptop password. You could set up another set of ssh keys for your server if you would like, but the sshfs command has an option to get your password from somewhere else and that is how I did it. That will be explained later. If all is well up to this point, you can fire up the Back In Time gui to configure your backup. On the command line, the command to enter is “backintime-gnome”. You still should be ssh’ed into your server, or be at a server terminal. Notice that my ssh command from above has the option -X in it. This will allow X display forwarding so you can run a gui program from your terminal box. This should bring up the Back In Time gui, ready to configure. Click the “settings” icon on the Back In Time gui. If you are using a newer version of Back In Time, you can select a “New” profile. Mine is called “ubuntu-laptop”. Then you need to decide where to put your backups. I have a usb drive mounted at /home/shared2. You need to traverse to the point where you want your backups to go using the folder icon to the right of “Where to save snapshots”. Leave “Schedule” disabled as this will be handled in one of the script files. Click the “Include” tab and add the folders you want backed up. Remember that I have my laptop mounted at /home/myname/ubuntu-laptop on my server. This is where you need to go to include the included folders. 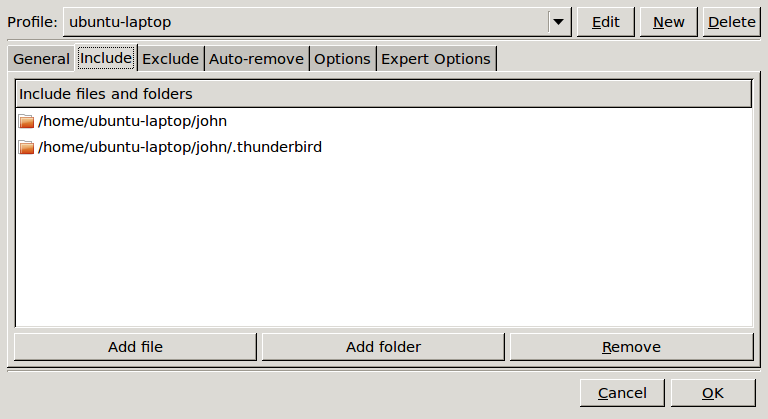 Notice I have a seperate entry for my Thunderbird email folders. This is because I have any hidden files . * excluded from being backup up and my Thunderbird email folders are inside a hidden directory. Click the “Exclude” tab. Add any files or folders you do not want backed up. As you can see, I added an entry to skip all my configuration files with .* . You need to decide what you want backed up. I also excluded my download directory, my virtual machines folder (large files for experimentation only), and any other directories where I might have other systems mounted in. Click the “Auto-remove” tab and decide how many backups to want to retain. Click the “Options” tab. I added one checkmark here that was not already checked. I checked “Continue on errors (Keep incomplete snapshots). I did this because I had a snapshot fail because of some protected .files. I suggest you click this box, at least at first. Then after you make backups, you can look at the log file to see what failed. Otherwise, you will never get a backup if there is an error somewhere. I did not adjust any of the “Expert Options”. Click “ok” and this should bring you back to the main “Back In Time” window. If you like, you can make your initial backup by pressing “take snapshot” icon. Your first backup may take a good amount of time, depending on your wifi connection, and the size of your backup. Mine included many video files, and took well over a day and a half. Subsequent backups are quite quick, depending on what new or changed files your need backed up. If all is successful to this point, you can close the “Back In Time” gui. I suggest you wait until your initial backup is done, as the backup will continue even after you shut the gui, but this may cause problems when you try to setup the rest of the system. This is the script “start_laptop_backup.sh” that is run on the laptop side, to initiate the backup. # Automated backup of laptop, that is not always on, to a server that is always on. # Is the server pingable? This is what this script does: First, I try to ping my server to see if is available. If it passes that test, I connect to the server over ssh and run the script “backup_ubuntu-laptop.sh”. No password needed if the ssh keys are set up properly. Here is the script on the server side called “backup_ubuntu-laptop.sh”. # This is a script that is run on the server. It is started from a script run through ssh from the laptop to be backed up. # Connect to ubuntu-laptop from server. This script first mounts the laptop via sshfs. Notice the “-o password_stdin” option. This enables the password to be entered from another source. In this example, I have the password in a file called laptop_pwd in my Scripts directory on the server. As mentioned earlier, you could set up ssh keys for the server and eliminate the password in a file thing if you feel that is unsafe to do. This script then confirms that the laptop is indeed mounted. 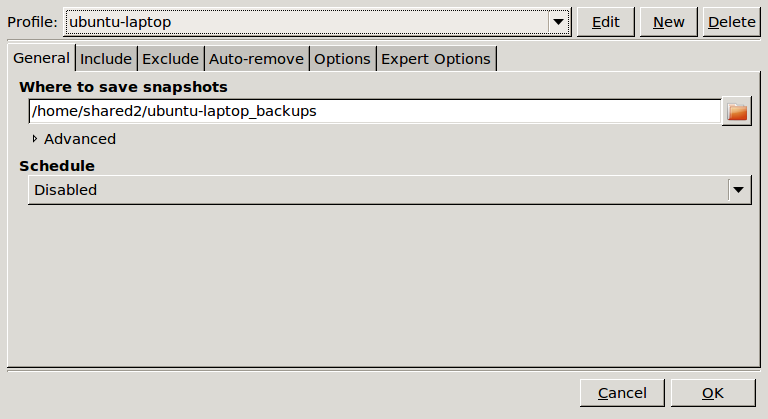 It then initiates the backup with the command “backintime –profile ubuntu-laptop –backup”. After the backup is finished, the script unmounts the laptop and closes down. To test all this, open a terminal window on your laptop and start the script “start_laptop_backup.sh” and watch its progress. If all worked out, and you already made an initial backup, it should run relatively quick. You can find a little tutorial on anacron at “http://www.thegeekstuff.com/2011/05/anacron-examples/“. I added one line to the bottom of the anacrontab file as shown above. The first parameter “1” means it should be run once a day. The second parameter “13” means it will start approximately 13 minutes after the machine is booted. You can change this to whatever you want. Set it at a time where it won’t interfere with the busy boot process, and anything else you might do as soon as you turn on your computer. The third paramater is a label you make up to identify this process. The fourth parameter is the command to execute. By placing “nice” before the command, if the system is very busy, the backup process will wait until the system is less busy. You can look up the manual page for “nice” by typing “man nice” in a terminal window. That about does it. If everything worked so far, you are ready to reboot your computer. Anacron should run and a backup initiated. Anacron will only run once a day even if the laptop is turned on several times a day, or left on for days. You will still only have one backup per day. You can look at the files in /var/spool/anacron. 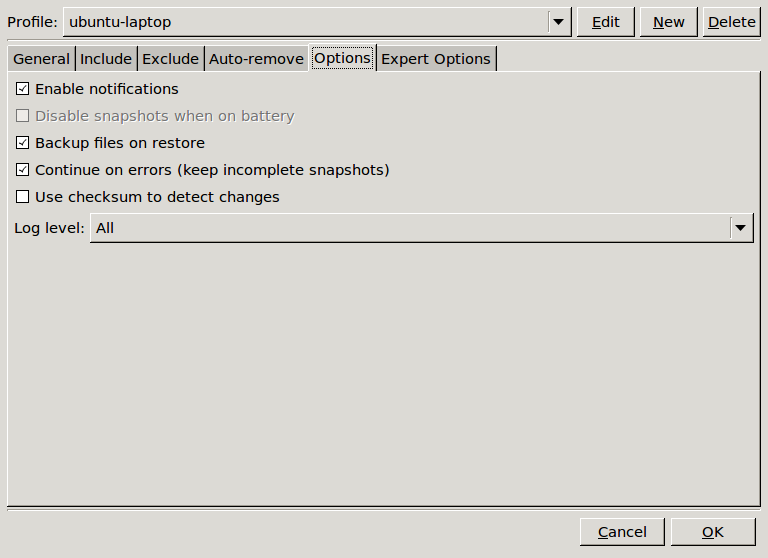 ubuntu-laptop (or what ever label you used in the anacrontab file) should be listed there. Open it up with nano or gedit, and it should list the last date that line in the anacrontab file was executed. I hope this post helps you in your laptop backup. It might seem kind of complicated, but I enjoyed the process of learning and figuring it all out. Have fun in exploring linux! Another Ham discovers Linux’s ham friendliness. 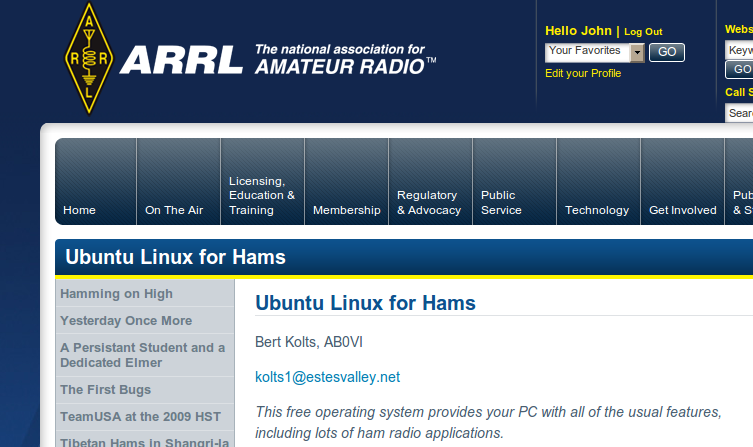 ARRL’s website has another nice story about a Ham using Ubuntu Linux and fldigi to renew his love for Amateur Radio. Check out the post HERE. Good going Steve (KØSRE)! For more of Linux In The Ham Shack, check out “Linux In The Ham Shack” podcast. My computers run on the Ubuntu Operating System – Not Windows. If you did not know there was a choice other than Windows and Macs, you need to check out the totally FREE operating system Ubuntu! Besides the operating system being free, ALMOST ALL of the application programs are free. There are thousands of them, doing almost anything you need to do on a Windows or Mac machine. And, if that weren’t enough, most of those thousands of free programs are installable from inside Ubuntu itself. You don’t have to go searching the Internet for them. Usually just ONE CLICK, and boom, your program is installed. Besides all that, there is very little worry about viruses as on Windows, and increasingly on the Mac. It is really NICE! Anyway, that is not really what this post is supposed to be about. This post is about a nice theme that I came across for my Ubuntu desktop. Ubuntu, besides being FREE with lots of FREE applications, it is very nice looking, and if you want to dig deeper, you can make it REALLY nice looking. I usually have my Ubuntu Desktop all decked out with some sort of modified Emerald theme, with transparency, and glowing frames and pulsating buttons and such. As I was searching around one of the many Ubuntu web sites, I came across a proposed theme for the next version of Ubuntu coded named Maverick Meerkat due to be released on 10/10/10. I am sure this nice theme I found will not be a default theme, as purple and orange seem to be someones liking on the Ubuntu development teams. I am personally not that thrilled about the purple/orange theme, and usually look for other options. The theme I came across is a beautiful blue theme called Ambiance Blue. It is not fancy, or full of glowing parts, or throbbing buttons, but is a very nice looking simple blue theme. The Ambiance Blue Theme can be downloaded from HERE. See the picture of my theme below, or click on the small screenshot to see a larger view of one of my desktops. Yes, in Ubuntu, you have MULTIPLE VIRTUAL DESKTOPS. Very Nice! The corner of my web page with a link to view my Ham Radio log file. Being a Ham Radio operator, I’ve wanted, for some time, to display my log file on my web site. I’ve been researching it for some time, and mostly ran into methods that require java or php, or some sort of web scripting. This is beyond me and I wanted something simpler; and this is what I have come up with. My computers run on the Ubuntu Linux Operating System. I came across a small command line utility program called txt2html. The name pretty much explains what it does. It has many features that include many formatting options; one being, that I can pre-append a file to the front of another file. I tested this feature to apply a preformatted html heading to my log page. I made a simple sample of a text log page listing contacts, and ran it through txt2html and it attached my header to the log page and spit it all out as an html file ready to display on my web page. Now, to do the whole process, I just had to update my log file, save it, and run the script ‘log_doit.sh’ and it would be on my web site. After I put all this together, I remembered hearing about a Linux logging program called cqrlog, on the ‘Linux In The Ham Shack‘ (link updated 9/2010) podcast. If you are a Ham Radio Operator or use Linux, I strongly suggest you give this great podcast a listen. It is always entertaining, and they have covered some very useful stuff for the Ham that is running a Linux operating system. Anyway, I downloaded and installed ‘cqrlog’ and started playing with it. I was specifically looking for a way to export the log file so I could run it through ‘txt2html’. Lo and behold, ‘cqrlog’ does one step better; it exports the log right into the ‘html’ format. Wow! Perfect!. I learned a lot by using txt2html, but now I can skip that step completely and just export the log file in html format and run a simpler script that runs ‘kermit’ to upload the file to my web site. Click HERE to see the actual page on my web site. As of when this was written, the file is a test one that was created by playing with ‘cqrlog’. It will change once I start using ‘cqrlog’ for real. I used the method, previously described, to make a bootable USB Ubuntu thumb drive for a co-worker. The process failed for his particular thumb drive, saying “Missing Operating System” when he tried to boot with the USB thumb drive. 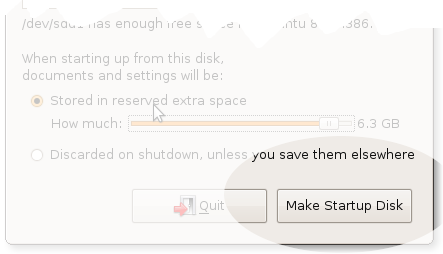 After some research on the subject, it seems that a lot of thumb drives have this problem with Ubuntu. 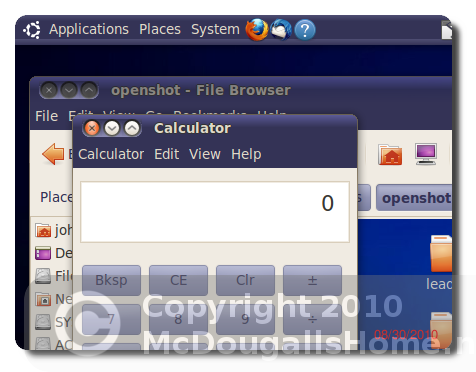 I found the solution at http://ubuntuliving.blogspot.com/2008/11/missing-operating-system-step-by-step.html . Dominique’s step by step “How To” worked perfectly for me. If you have problems with your Ubuntu USB boot thumb drive, give this “How To” a try and you might be pleasantly surprised. The computers in my Radio Shack and home run on Ubuntu Linux. A great way to share this good experience with others is through the Ubuntu Live CD. The downside of the Live CD, however, is that no changes are saved. 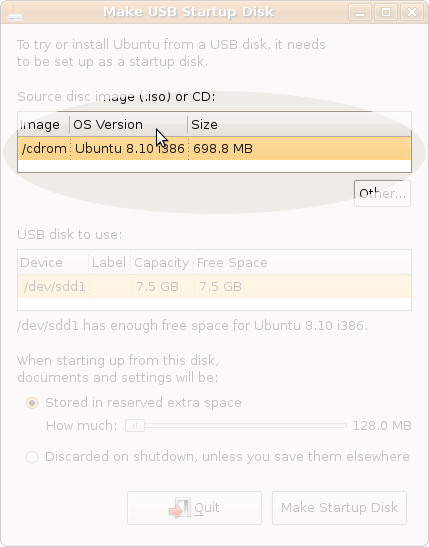 To get a more lifelike experience in the Ubuntu demo, a bootable Ubuntu system can be loaded onto a USB thumb drive. With this method, any changes will be kept on the thumb drive. With the USB bootable thumb drive, it also means that you can carry your operating system with you with all the files you like to use. There certainly is a performance issue compared with a regular hard drive instalation, but having your e-mail, internet, audio/visual programs, ham radio programs, etc. with you all the time, available to use on any computer that can boot by USB, is an awesome thing. 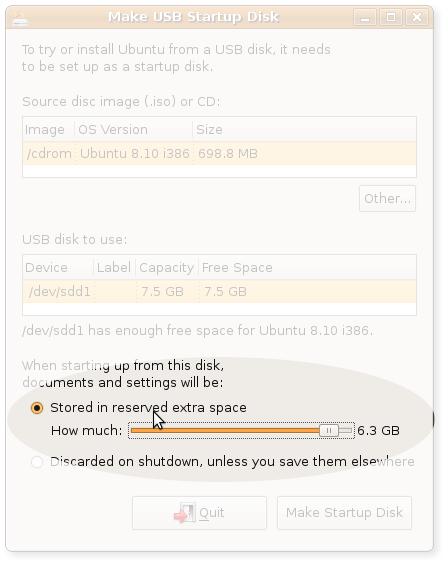 Here are some detailed instructions to make a bootable USB thumb drive from the Ubuntu 8.10 live CD. Download PDF of this page. 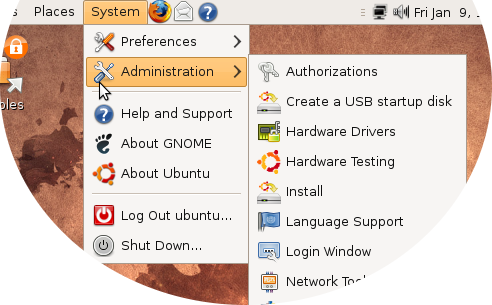 Select “Administration” under the “System” menu. USB information should appear in the middle. If the USB thumb drive is not inserted, you can do it now and the information should appear. Make sure “Store in reserve extra space” is selected. 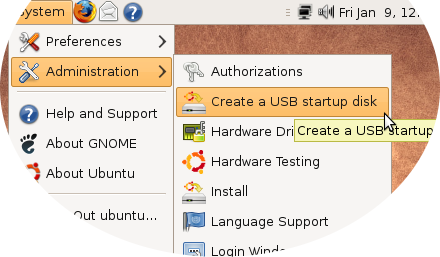 Move slider to the right to allocated additional memory on the thumb drive for the Ubuntu system. If you want a bit unused (eg. ½ GB) for other files, do not go all the way to the right. 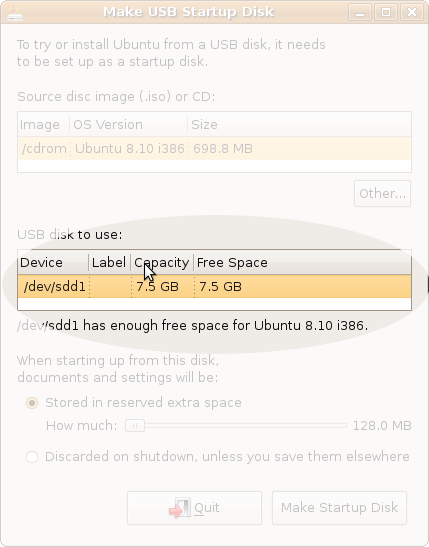 Note – This “unused” portion, or any files on the unused portion of the thumb drive WILL NOT be accessible when Ubuntu is booted from the thumb drive. The system will begin to copy the Ubuntu Operating system to the thumb drive. This completes the installation of Ubuntu onto the thumb drive. Reboot the computer with the thumb drive in place and enjoy Ubuntu.